Elevation / Altitude: 3800 meters. A Full listing of Maqên and County Landmarks, Monuments, Hotspots and other sites of importance in alphabetical order. Search through the list to find your Full Report and Photo-Virtual Tour of each monument or landmark within the City, or Region of Maqên in Golog Prefecture, Qinghai Province of China (PRC). No information is available on the Main and only Railway Station of Maqên. Maqên has a Railroad Station. Throughout most of recorded history Maqên was a Town in the Golog Region of Amdo Province of Tibet. Although the Province of Qinghai was created on paper in 1928 AD, in practical terms it was only established during the 1950's under The Government of the Peoples Republic of China. Maqên is currently the administrative seat for the Government of Golog Tibetan Autonomous Prefecture. At the moment many of Qinghai's nomadic herders, some 55,700, are being forcibly relocated away from the Yellow River valley under a Government Program completed to be completed this year in 2010. The reason for this huge move of people is the gradual degrading of grazing grounds by a combination of climatic changes and overgrazing by the nomads animals. Through the plan, in stages the majority of herdsmen will be moved from the vulnerable river source, being resettled in Government provided mud-brick housing. Reportedly some of these have been settled in Maqen county (Town), where they have learnt another life skill - weaving Tibetan-style carpets. Naturally, the settling of the nomads causes a dramatic change of their lifestyles, economic affairs and cultural traits. It is one way the Qinghai Government is attempting to integrate and possibly sinisize the ethnic population of the Province. Maqên County is a county of Qinghai Province, China. The Town of Maqên is the administrative Capital of Golog Tibetan Autonomous Prefecture (果洛藏族自治州). It lies in the south-eastern corner of Qinghai Province near the 'Boot of Gansu Province', a geographical feature shaped by the curves of the Yellow River (Huang He) in this region. The famous Longyang Gorge of the Yellow River and its 2nd largest hydro-electric Dam in China lie at some distance North of Maqên Town. For more information on Longyang Gorge and the Longyangxia Dam, please read: 'Scenic sites of Xining Region' and 'Highlights, Monuments and Scenic sites of Xining Region'. The nearest point to view the Yellow River from Maqen Town is the village Lajia. Maqên is the Capital Town of Golog Tibetan Autonomous Prefecture (果洛藏族自治州). Thus, it has a large Population of Tibetan inhabitants. 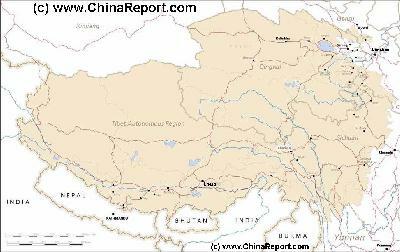 For all available Maps relevant to Maqên and Golog Tibetan Autonomous Prefecture (果洛藏族自治州) please refer to Qinghai Province Maps Index. 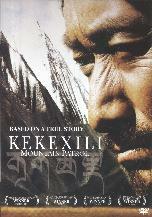 Golog Prefecture is also known by its local Name of Kekexili. The County includes the year round snow-covered Amnye Machin Peak of 6282 meters, south of which lies the (supposed) origin of the Yellow River itself (it was later discovered that the real source lands are located more to the West in Yushu Prefecture). Expeditions have traversed this area and region to locate and research the source waters of the river, and have found that traveling through these parts in motorized vehicles is virtually impossible. Due to the nature of the soil, which consist in many parts of grassy tundra interspersed with tiny streams and bogs (marshes), all that can go there are mule's, yaks, camels and possibly horses. Traversing main roads is no problem. 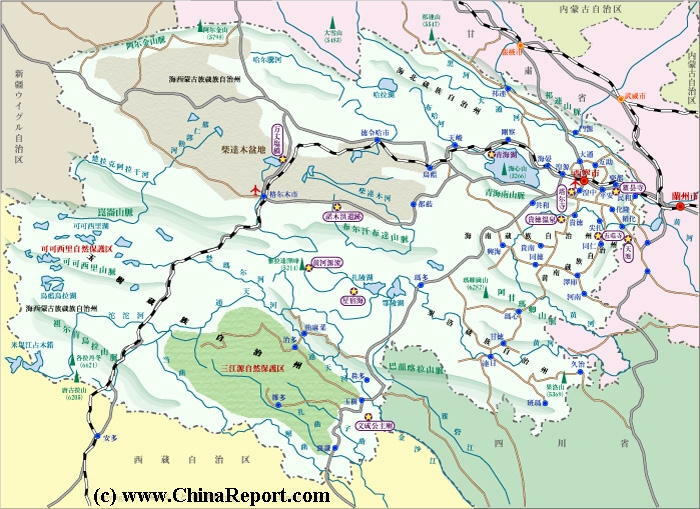 Maqên County is known as one of the roughest territories in the entire Nation (China). Even in the best of seasons, when the ground is frozen solid, traversing remains difficult if only due to the enormous altitudes (3800 meters to 5600+ meters) involved, and the rapidly changing, cold and unpredictable weather of the Qinghai Plateaux. tain valleys, including the largest one; that of the Yellow River (Huang He) is majestically surrounded by the red and blue Mountains. In the right travel season (may/june) the grasslands will be filled with colorful flowers and the cultured lands will display the early green of the Tibetans' favored barley. The scenery can be fantastic on a beautiful day. and never turn back your head. If this means Goloks are stubborn people, or simply easy going is unclear. Maqên and County are critically prone to earthquakes and the Town itself sits at the very southern end of a fault-line which extends for a 1000 kilometers, via Lanzhou in Gansu Province to Jingbian on the Ningxia AR/Shaanxi Border. 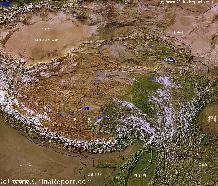 Due to the unique geology of the region, wedged between the Indian Sub-continent and the Eurasian Plate and near the leading edge of the Tibetan Plateaux, Maqen is frequently hit by medium sized to large earthquakes. 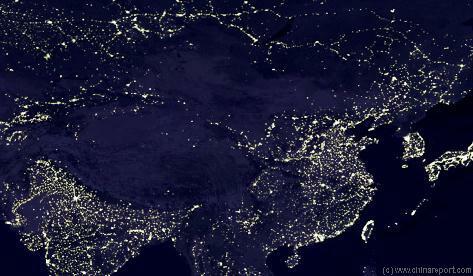 The latest earthquake however struck on April 17Th 2010 in Yushu County, just to the West. Various aftershocks and earthquakes measuring up to 4.7 on the Richter Scale have been recorded since.